(CNN) Tiger Woods can add President-elect Donald Trump to his power list of golf partners. 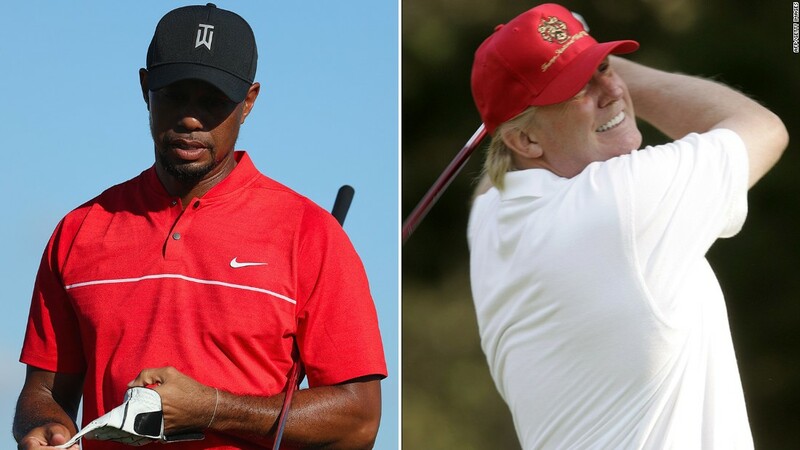 Former world number one Woods played 18 holes with the current White House incumbent Barack Obama back in 2013 and repeated the exercise with Trump in Florida Friday. Few details of the latest round have been released, but pictures emerged on social media of Woods, sporting a goatee beard, and Trump on the course owned by the tycoon in Palm Beach. Stephanie Grisham, a press spokesperson for Trump’s transition team, confirmed that Woods and Trump played in a foursome before he went to the West Palm Beach Hilton for meetings with “high-level staffers” — news agency AFP reported. Trump, whose handicap is listed at an impressive 2.8 by the US Golf Association, owns several prestigious courses, including the famous Turnberry links in Scotland, which has hosted the British Open. His organization was also behind the Trump International Links in North Aberdeenshire, which was completed in 2012 after a lengthy planning battle over environmental issues. It received the backing of the Scottish government, but Trump fell out with its administration over plans to build an offshore wind farm within sight of the new course. Woods, who recently returned to competitive golf at an invitational tournament in the Bahamas, has yet to reference the round on his official website, while his latest posting on Twitter has a festive theme. The 14-time major winner will celebrate his 41st birthday on December 30 ahead of the 2017 season — recently announcing he will tee it up at the Genesis Open in Los Angeles in early February. Woods battled back problems, which sidelined him for 15 months, but showed glimpses of his old self at the Hero World Challenge earlier this month, including a second round 65. Trump, who takes office on January 20, criticized Obama during his election campaign for spending too much time on the golf course and has claimed he will limit his sporting activities after moving to the White House. Obama has reportedly played over 300 rounds while president and is currently finding plenty of time for his favorite sporting past time while on vacation in Hawaii.